Jule Wurm writes about winning the Innsbruck World Cup! But then then next training sessions felt pretty good, and I decided to participate in Innsbruck. Maybe the best descicion I took for this year. But then, everything just worked out perfectly! First boulder – flash, second boulder- flash, third boulder – second go… WOW, I knew I was leading and I could win, if I flash the last one…I had the last boulder in my mind: CRIMPS. Ahhh! I tried to focus, but not too much, so as to not get too nervous. During the first three boulders, time passed fast, but as I waited for the last boulder, 10 minutes seemed like ages. I was trying to remember each detail of the boulder together with Anna and Mélissa. It’s soooo nice to compete with them in a friendly atmosphere!! Then it was my turn. I didn’t feel extremely nervous, but I only wanted to flash it really hard! Few seconds later my dream became true. I flashed the last boulder (soo close ;)) and won my first world cup in front of Anna Stöhr (with one more try…) and Akyio Noguchi. I walked down from the stage, took a look at the screen and saw that Jan won as well!! Such an emotional evening! 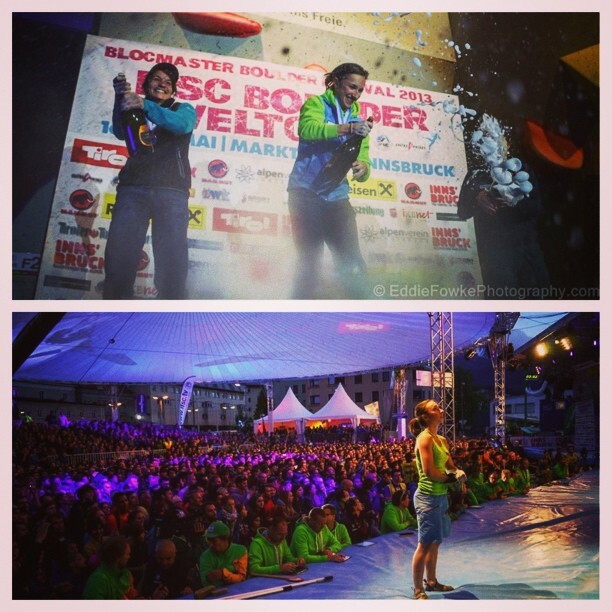 Follow a World Cup boulderer – Follow Jule on Tumblr!